While the first team fixtures for the season might now be over, the Reserves are still going full cry and no more so than this weekend. 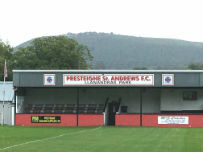 Saturday, 13 April will see Alan Stocker take his side to Llanidloes Town Reserves for their Pip Samuel (Electrical) Mid Wales League (South) Cup semi-final tie. The Reserves have done well to battle through to the last four of this competition and they will know that they could face a stiff test at Llanidloes. Llani’s second string proved far too good for Builth Wells Reserves in the last round when they came away from Lant Field with a 4-0 win. But Presteigne Reserves were also in good touch in round two – they beat visiting Hay St Mary’s Reserves 7-1 at Llanandras Park. Then – 24 hours later – it will be back to Llanandras Park for an Alfred Sparey Cup semi-final tie in which the Reserves will host Knighton Town Reserves in a 2.30pm kick off. Admission prices for the Sparey Cup tie will be the same as those for a Reserves league fixture, so £2.00 for adults and £1.00 for senior citizens and those under the age of 16.